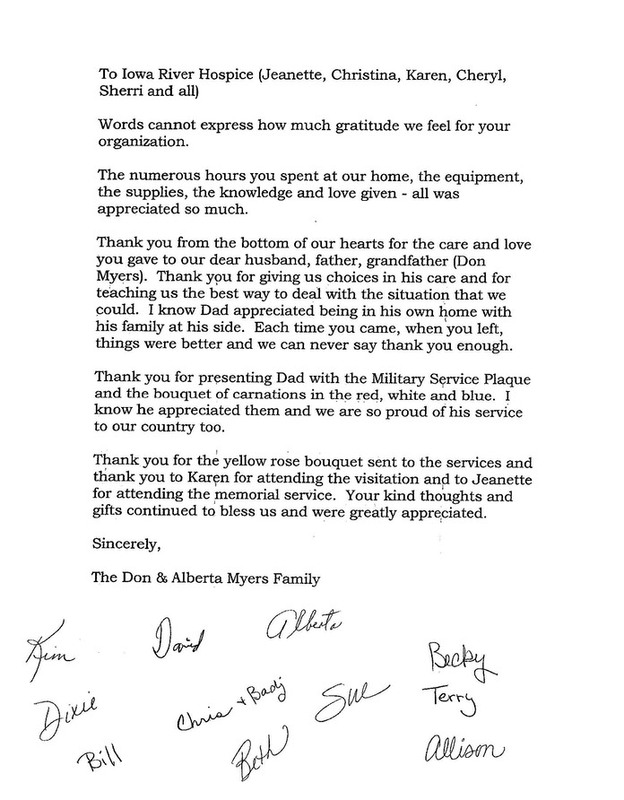 We thank you and are aware of the amazing support we receive from so many. Your support, kind thoughts and prayers are what help us be who we are and enable us to provide the experienced and compassionate care we are known for. Words cannot possibly express my gratitude for the care and compassion provided by the Iowa River Hospice team during the final days of my mother’s earthly life. I cannot imagine a finer facility, staffed with such a professionally skilled and loving team of people who are so clearly committed to doing whatever they possibly could to make mom’s last month as comfortable as possible for both her and all of her family. I will always remember the countless ups and downs, the walks, the massages, the runs to the store for ice cream to make yet another shake, and the many off-topic discussions that helped the time pass and momentarily took our minds away from the reality we were facing together. Most of all, I’ll never forget the hugs that were so graciously offered, so tremendously needed, and so much appreciated. I will always consider you all among my most dear friends.